The works of Takashi Amano are often startingly on first look. The use of aesthetics in what is usually just the pet trade makes the clever and thoughtful touches of his work stand out. 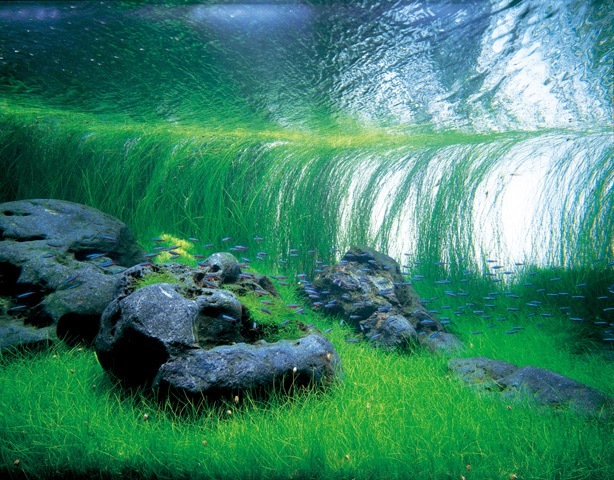 Amano was a Japanese aquarium maker who excelled at revealing the beauty of natural forms in cleverly engineered ecosystem we called aqua design or more popularly known as aquascaping. Amano managed to install aqua scapes with a sense of permanence as if any naturally occuring envionment would ever stay in as complete status as his aquascapes do. In that they reveal a hidden hand: Amano’s aqua scapes are carefully controlled, crafted, yet manage to capture a disorganized beauty we usually only see in the nature.it is by a careful understand of those slippery dynamic systems that Amano is able to achieve such simplicity. Electric motors, carefully placed plants, and selected fish all become the cybernetic appartus that maintains a perfect algae bloom that juxtaposes perfectly with schools of betas. Technology can produce silence and that quiet is visual, the aural feedback of all the filtering systems and pumps behind Amano’s designs are far less aggravating compared to the silence of the landscape. ABZÛ – with a name that translates into body of knowledge AbZu, which is a spirtual follow up to Journey, wants us to believe it is a profound or meaningful experience. Meaning here being defined those moments when the mystical rains down and some nonlinguistic understanding overcomes us, in other words a spiritual experience. It is the later that AbZu excels at. Heiroglyphics suggest this is a creation myth and schools of exotic fish placantly swim by like an Amano aquarium that has gentrified into full blown cosmpolitianism. But AbZu at heart is algorithims. It’s lush overly dense ecosystems are like vivrant stereotypes of the coral reefs and kelp gardens divers lumber through daily. Yet the game reveals some serious limitations. This is not Aquanaut’s Holiday, AbZu often feels more confined than even Amano’s creations, the game takes place in a sliver of ocean teeming with schools. This is not a quiet world. Dolphins click, an orchestral soundtrack soars, and the ocean is busy. In other words its a lot like diving. But is is this maximalism, which is much more like the real ocean than Amano’s calm, which also reveals the hand behind all of this. AbZu isn’t like nature, rather it is a series of algorithims intended to provide Disney like moral lessons that paint disrpect for the oceans in completely black and white terms. It is a love letter to diving, but the game is heavy handed in approach. AbZu is a hyper real myth of oceanic becoming and in that feels all the more fake for it. 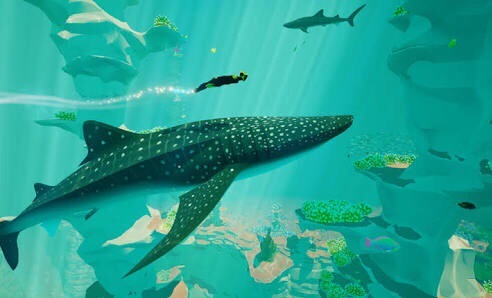 The ocean is mysterious and large enough itself, AbZu on the other hand schools a little to perfectly, presents its enviroments are a little bit to grand. Its as if nature obeyed the plot of Beauty and the Beast. In that it is a nice psyedelic shot of earth worshipping goodness. Take it with ease, and remember sharks do smile, its just thst the game is more interested in a cinematic experience of the corsl reef when the actors in actual reefs always seem so much deeper as if they have something to say AbZu can not.